Underneath the Briard’s long, shaggy coat lies a bold spirit and keen intelligence. True to his French roots, he can be aloof with strangers, but is affectionate and loving toward members of his pack. Bred as a herding and guard dog to protect flocks and fight off predators, he was adopted as a working dog during World War I and used by troops as sentries, ammunition carriers, messengers, and medic dogs. Today, the Briard enjoys the life of a companion dog, but he shows his versatility and working nature with his great successes in obedience, agility, conformation, herding, carting, and tracking competitions. See below for complete Briard characteristics! Often called "a heart wrapped in fur," the Briard makes a great family dog. He is devoted to his owner, happiest following you around the house while you do chores or watching you watch television on a rainy day. The Briard is an ideal companion for someone who wants a lovable, but not overly dependent, dog. A member of the Herding Group, he weighs in at around 75 pounds and lives comfortably in the country or city — as long as he's with his family and gets sufficient exercise. The Briard is an intelligent breed and a quick study when it comes to training, though he can be stubborn and want to do things his own way. Owners must be prepared to establish pack leadership from an early age or the dog is likely to take a shot at the role himself. With a strong instinct to herd, it's not unusual for him to try to gather or keep the children or adults in his family within certain boundaries. He may nudge, push, or bark at his "flock." The Briard's wariness of strangers makes him an excellent guard dog, and he's forever ready to defend his family and territory if he perceives danger. With the proper training and socialization, however, you can encourage him to be more accepting of outsiders. A Briard puppy should be introduced to many new and different people, places, and situations during the first year of his life. These early experiences help ensure you have an adult Briard with a positive outlook on life. There are exceptions, of course, but for the most part, the Briard does extremely well with children. If you're bringing a Briard pup — or any dog — into a house with kids, it's important to teach both how to interact with each other. If you do not have children, but plan on doing so in the next few years, it's essential that you socialize your puppy to children. The Briard needs daily grooming. Although his coat is considered low- to non-shedding, it tangles and matts easily. If you do not have the time or patience for grooming, consider another breed. The Briard is naturally independent, which is a wonderful quality if your puppy has been trained properly. However, without training, that independent, confident puppy can turn into an unmanageable adult. The Briard must be socialized early to avoid aggression toward people or animals he doesn't know. Briards were bred to be guard dogs and still take this role seriously. The Briard enjoys being with his owner. He does best when he is allowed to hang out with the people he loves. The Briard originated in France and can be dated back to the 8th century. He was known as the Chien Berger De Brie, which is believed to be derived from his place of origin, the region of Brie (although the Briard was found in many parts of France). A more romantic explanation exists as well — that is, the name is a distortion of Chien d'Aubry. A 14th century legend claims that Aubry de Montdidier, a courtier of King Charles V, built a cathedral in memory of a valiant Briard who saved his son's life. Regardless of the origin of the name, the Briard can be linked back to the Emperor Charlemagne through his depiction in early tapestries. The Briard has also been linked to Napoleon and was the official breed of the French Army. The typical Briard is brave, loyal, and intelligent. He is good-natured and loving with his family, and thrives on participating in family activities. In spite of his large size, he is essentially a housedog. He doesn't belong in the backyard by himself, but curled up next to you while you sip mint tea. A protective guardian, the Briard can be aloof with strangers. He also can be stubborn and willful, but with plenty of encouragement and positive reinforcement, he can be persuaded to come around on both counts. Like any dog, the Briard can become timid if he is not properly socialized — exposed to many different people, sights, sounds, and experiences — when he is young. Primary socialization should be with people outside the household. Socialization helps ensure that your Briard puppy grows up to be a well-rounded dog. Briards are generally healthy, but like all breeds, they're prone to certain health conditions. Not all Briards will get any or all of these diseases, but it's important to be aware of them if you're considering this breed. In Briards, you should expect to see health clearances from the Orthopedic Foundation for Animals (OFA) for hip dysplasia (with a score of fair or better), elbow dysplasia, hypothyroidism, and von Willebrand's disease; from Auburn University for thrombopathia; and from the Canine Eye Registry Foundation (CERF) certifying that eyes are normal. You can confirm health clearances by checking the OFA web site (offa.org). Congenital Stationary Night Blindness (CSNB): CNSB affects dogs in varying degrees. It can be as slight as difficulty moving in poor light to total blindness in a dim light; it can also mean complete blindness in any light. Research is underway for genetic testing. Cancer: Symptoms of canine cancer include abnormal swelling of a sore or bump, sores that do not heal, bleeding from any body opening, and difficulty with breathing or elimination. Treatments for cancer include chemotherapy, surgery, and medications. Gastric Torsion: Also called bloat, this is a life-threatening condition that can affect large, deep-chested dogs such as Briards. This is especially true if they are fed one large meal a day, eat rapidly, drink large volumes of water after eating, and exercise vigorously after eating. Bloat is more common among older dogs. GDV occurs when the stomach is distended with gas or air and then twists (torsion). The dog is unable to belch or vomit to rid himself of the excess air in the stomach, and the normal return of blood to the heart is impeded. Blood pressure drops and the dog goes into shock. Without immediate medical attention, the dog can die. Suspect bloat if your dog has a distended abdomen and is salivating excessively and retching without throwing up. He also may be restless, depressed, lethargic, and weak, with a rapid heart rate. It's important to get your dog to the vet as soon as possible if you see these signs. The Briard can adapt to city or country life. He is a fairly calm breed when inside, but he does need 30 to 60 minutes of exercise daily. Without enough activity, the Briard can become bored, paving the way for annoying or destructive behaviors like barking, digging, chasing, and chewing. 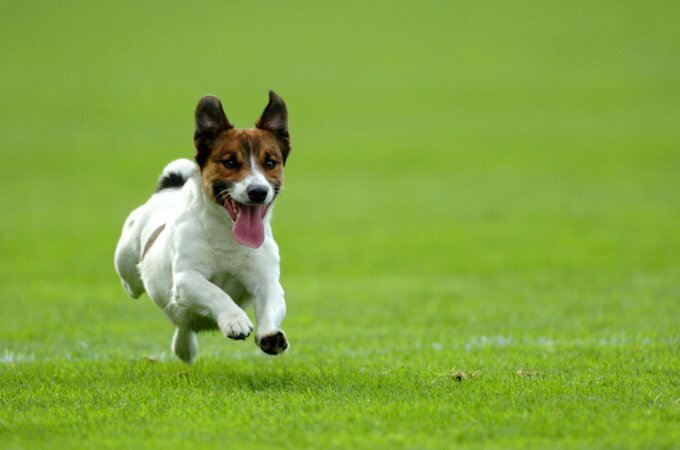 Dog sports, especially herding trials, are a good outlet for his energy and hone his natural herding ability. The Briard puppy must learn who the pack leader is or he'll try to assume the position; therefore, training should start as soon as the Briard puppy comes home. This doesn't mean he should know advanced commands by 9 weeks of age, but he should be learning proper manners and rules of the house right away. Crate training can be an important aid — it helps with housetraining and keeps your pup safe when you're away — but remember that he should be with the family (not in his crate) when you are at home. Because the Briard is naturally suspicious of people outside his "flock," it is important to encourage your Briard puppy to be friendly with strangers. If a Briard is not properly socialized and trained, it can lead to aggression toward people or animals he considers a threat. Keep your Briard in good shape by measuring his food and feeding him twice a day rather than leaving food out all the time. If you're unsure whether he's overweight, give him the eye test and the hands-on test. For more on feeding your Briard, see our guidelines for buying the right food, feeding your puppy, and feeding your adult dog. 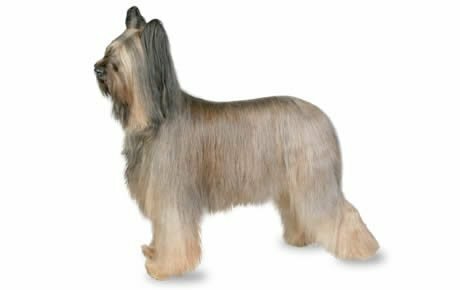 Although considered a low- to non-shedding breed, the Briard has an outer coat and undercoat. The outer coat is slightly wavy with a coarse texture, about six inches long, while the undercoat is soft and fine. You'll see it in a variety of colors, or combination of colors, including black and shades of gray and tawny. Do you have several hours a week you can devote to grooming your Briard? If not, consider another breed. His fabulous coat requires quite a bit of brushing, combing, and fussing to keep it looking good. A thorough brushing every day is recommended, plus a bath every six to eight weeks. Like all dogs with fluffy coats, the Briard can get dirty easily, so you're in for muddy paws, leaves or burrs tracked into the house, feces on the hindquarters, or a wet and dirty beard. If the idea of keeping up with the Briard coat is overwhelming, consider hiring a professional groomer to help. You won't get out of regular brushings between groomings, but bathing and drying the coat is much easier in a salon equipped with waist-high tubs and high velocity dryers. It's especially easy when you're paying someone else to do it! Brush your Briard's teeth at least two or three times a week to remove tartar buildup and the bacteria that lurk inside it. Daily brushing is even better if you want to prevent gum disease and bad breath. Trim nails once or twice a month if your dog doesn't wear them down naturally to prevent painful tears and other problems. If you can hear them clicking on the floor, they're too long. The Briard usually has rear dewclaws so don't forget to trim these, too. Dog toenails have blood vessels in them, and if you cut too far you can cause bleeding — and your dog may not cooperate the next time he sees the nail clippers come out. So, if you're not experienced trimming dog nails, ask a vet or groomer for pointers. Begin accustoming your Briard to being brushed and examined when he's a puppy. Handle his paws frequently — dogs are touchy about their feet — and look inside his mouth. Make grooming a positive experience filled with praise and rewards, and you'll lay the groundwork for easy veterinary exams and other handling when he's an adult. A loving and playful companion, the Briard makes an excellent family dog. He is protective of the children in his family, and has been known to "defend" them when parents discipline. As with every breed, you should always teach children how to approach and touch dogs, and always supervise any interactions between dogs and young children to prevent any biting or ear or tail pulling on the part of either party. Teach your child never to approach any dog while he's eating or sleeping or to try to take the dog's food away. No dog, no matter how friendly, should ever be left unsupervised with a child. If the Briard is raised with other dogs and pets, and learns they are members of his pack, he gets along fairly well. However, his prey drive is strong, so training is necessary for him to learn not to chase the family cat or quarrel with your Beagle. Supervision is a good idea, as animals outside his immediate family are likely to trigger his instinct to give chase. Keep him on a leash when you are in public. Briards are often purchased without any clear understanding of what goes into owning one. There are many Briards in need of adoption and or fostering. There are a number of rescues that we have not listed. If you don't see a rescue listed for your area, contact the national breed club or a local breed club and they can point you toward a Briard rescue. Below are breed clubs, organizations, and associations where you can find additional information about the Briard.